Tucked away in the Minneapolis first-tier suburb of Eden Prairie, there is a 125-acre park, which features 4 miles of hiking trails within a very geologically diverse setting. Only a 20 minutes drive from downtown Minneapolis, the Richard T. Anderson Conservation Area is a little park with a rich natural history. Wedged between a suburban neighborhood and the Minnesota Valley Wildlife Refuge, this unknown gem is gaining popularity outside of its local community. Recently established in 2006, this park was saved from urban development by the local community and the Minnesota DNR. Adjacent to the Wildlife Refuge, the park has the characteristic steep hills, exposed rock, and floodplain forest commonly found along the Minnesota River Valley. Though small compared to the other parks found in the river valley, this area offers trails with several changes in elevation, a small “Big Wood” forest, and amazing views of the Minnesota River. From the parking lot, the trail begins in the floodplain forest. Sometimes considered a bottomland forest due to seasonal flooding, you will see many oaks or even bald cypress bordering the trail. The trail is packed dirt, but outside the trail the soil is soft and full of detritus. If the water is low, you can see where the water normally is due to the exposed aerial roots. This trail stays flat until you reach a crossroads. Take a left and prepare for a short, but steep climb up the ridgeline. The hill is just tall enough to get over the bottomland forest tree canopy, so just work your gluteal muscles until you reach the upland grassland. Once you reach the top, you will see sweeping views of the Minnesota Valley National Wildlife Refuge. To the left are an interpretive display and a bench so you can take a moment and catch your breath. If you need respite from the sun, descend down the ridge towards the tall basswood and sugar maple trees. Not commonly found in the area, this “big woods” forest is a special treat. Hikers with binoculars will be afforded sightings of cedar waxwings, common nighthawks, great horned owls, or even an elusive red-shouldered hawk’s nest. Even without fancy specs, the birding opportunities are optimal, especially during the annual fall and spring migration. Keep an eye out for migrating yellow-rumped warblers feeding upon fallen seeds. During the fall, this part of the hike is very beautiful, since the sugar maples turn into a fluorescent red-orange, giving the trail an orange glow. The “big woods” fade behind you as you enter a wetland with a rare sedge meadow. Sedge meadows are closed wetland communities with nearly 100% vegetation cover and are a threatened ecosystem due to artificial drainages implemented in urban areas. They need the perfect balance of water levels, sunlight, and saturated soils to subsist. Not to mention that the sedge meadow provides refuge for many species of bird and mammal, but also they are important in water quality protection and floodwater retention. This is why Richard T. Anderson Conservation Area was established; to protect these fragile, yet important ecosystems. After the boardwalk, follow the creek until you return back to where you initially climbed up the ridgeline. From here you can choose to end your hike or finish the other 2 miles of trails, which will take you to more steep ridges or rolling prairie. If you’re looking for a trail that is off the beaten track, then Richard T. Anderson Conservation Area is the perfect place for you. 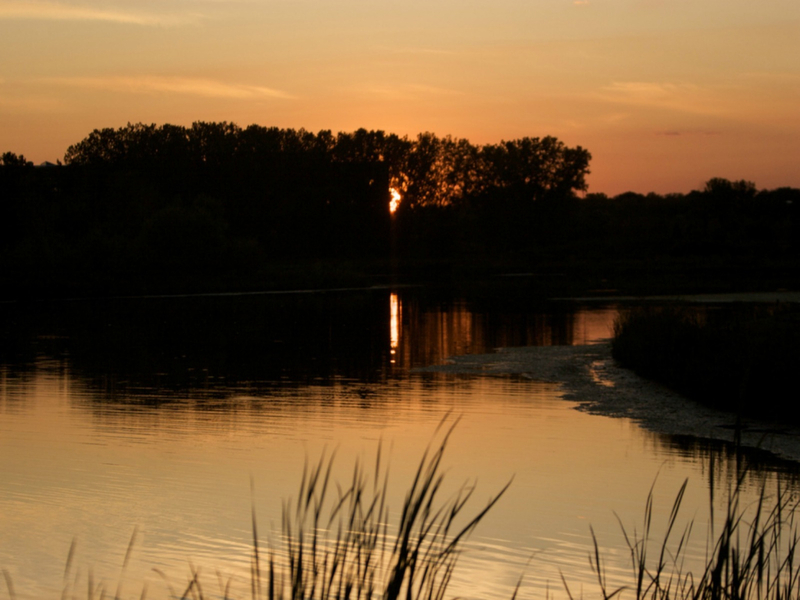 Richard T. Anderson Conservation Area is open from sunrise to sunset. There is parking available at the park entrance, just off Flying Cloud Drive.